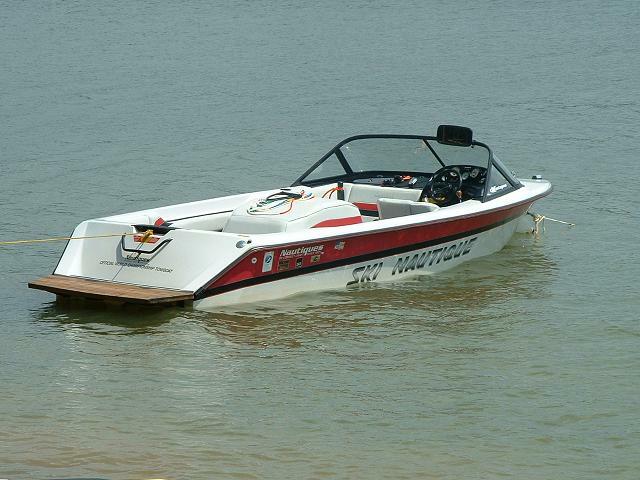 The First-Ever Super Air Nautique GS20 Launches! This past weekend we introduced ultimate versatility in 20 feet of perfection at the GM Heritage Center in Detroit, MI with the first-ever Super Air Nautique GS20. Hundreds of people were in attendance as Team Nautique athletes Shaun Murray, Nate Smith, and Drew Danielo joined athlete & account manager Adam Wensink along with Nautique President Greg Meloon onstage for the reveal. The release of this boat brings waterskiing, wakeboarding, and wakesurfing together like never before, and it absolutely lived up to everyones expectations during the weekend of demos following the launch event. Gathering at Silver Spray Sports Lake Jepawit in Gaines, MI, waterskiers, wakeboarders, and wakesurfers all lined up to experience one boat together with a seamless transition that kept everyone smiling. Weve captured the essence of what being out on the lake is all about delivering the most important thing in watersports; pure fun. Pro athlete demos and clinics with Nate Smith, Matt Rini, Shaun Murray and Drew Danielo gave everyone a unique opportunity with some of the riders and skiers that watched this new boat come to life. Drew Danielo - When I first got the call to come to Nautique Headquarters and test the surf wave on the new 20 boat, I was a little concerned. We have all ridden a 20 crossover and the surf wave, well, it just wasnt much to talk about. I can tell you that I was completely blown away. 20 boat, stock weight and I was riding 15 off the platform on a perfectly shaped wave that had a ton of push all the way back to the white water. It was so good that if this was my personal boat I would be very happy. After the launch weekend of the GS20 I am convinced that Nautique has built the first true crossover boat. I watched slalom skiers rip through the course and turn 6 buoys with a smile on their face. Then with the same boat we had numerous wakeboarders blasting wake to wake. They couldnt get over the size of the wake or how much pop it had. Then with the touch of a button on the GS20 we had everyone from 7-year olds to 65-year olds catching a wave down the lake. It was so much fun to be a part of the testing and launching of the Nautique GS20, and I am excited that there is a boat for the all-around water sports family. Nautique hit another Grand Slam with this new boat. Matt Rini - My first interaction with the new GS20 was about 4 weeks ago when I drove it for Whitney McClintock at the factory. My first impression as I stepped into the boat was wow detail-detail-detail. This boat has clearly been designed by people who use and love being in boats. The new 12.4 inch touchscreen, the toggle selection knob, seat height, cell phone holders and cup holders are all simply and perfectly place for easy access. As I drove the boat through the course the visibility was great and easy to line up the buoys. After Whitney skied, Shaun Watson had his first ride and surf behind the boat. His comments and excitement about how great the wake was for a 20 foot boat was telling that Nautique had nailed the wake side of this boat! About a week later I had the opportunity to ski behind the boat for the first time. The wake is different than the 200 that I normally ski behind but I was very surprised how flat the wake was. The NCRS plate keeps the running profile of the boat nose down to keep the wakeboard portion of the boat on top of the water. Its truly amazing to watch a boat go from a massive wake for surfing to a flat wake for slalom with the push of a button and a 5-minute break. I was fortunate enough to go to the launch of the boat in Detroit at the GM Heritage Center. What a fitting place for the launch of such an industry first of its kind. We were surrounded by concept cars from GM from the last 60 years. Totally an amazing atmosphere; the food, drinks and music set the stage for Shaun Murray and Adam Wensink to walk everyone through the new boat. The following two days we demoed with local skiers and riders who came out to try the boat. Lots and lots of smiles of surprise by how good the boat was to ski behind. People were very impressed with how much room the boat has and the great functionality. Hats off to Nautique for yet another home run. Nate Smith - When I first walked into the GM Heritage Center I could not believe the history that was in the building. From cars that never went into production to cars from 1902, it was amazing to see the progression over the years of where production of vehicles has gone. It was only fitting to have our product launch at the Heritage Center. As we start our journey with the GS20, we are making history as the first boat that can really do it all. Being in the boat and on shore for the on-water demos I lost track of how many times I heard the sentence, Wow, I cant believe how impressive the GS20 is. Everyone that came out to demo the boat got to spend time with some of the best athletes in the world. Seeing people get to try something different and successfully getting up on a wakeboard, wake surf, or ski for the first time and seeing their facial expressions and excitement was priceless. Not one person from the whole weekend walked away disappointed. Shaun Murray - Couldnt have gone better! is a great phrase to keep hearing from everyone on the team and means even more coming from so many of the customers who attended our GS20 Launch event. When you are surrounded by over 100 years of automotive history at the GM Heritage Center, we were Td up for a great night. The teaser video ended, the curtain dropped and the fun continued through the weekend. The on water demos allowed the GS20 to show its stuff, and proved to be the most versatile without compromise boat the market has seen. It was great to see such a balance of different things going on behind the new boat with wakeboarders, surfers and more skiers than Ive seen in a long time. This boat is really going to allow the groups and families that like to keep all options open for what they want to do on a particular day. Ive said it more than once, and Ill keep saying it, You have to remind yourself that you are in a 20-foot boat because not only does it put out a pretty big surf and wakeboard wake, but the amount of space inside the boat for storage and passengers makes you feel like youre in a much bigger boat. Peoples reactions to the GS20 have been nothing short of awesome and really made for one of the best launches Ive been part of.